In October 2014, a father and his 8-year old son on the D&R Canal trail in Princeton were struck by a car while crossing Washington Road. The crash sent both to hospital with serious injuries. Although Princeton Council quickly passed a motion calling for a crosswalk to be added at the unmarked trail crossing, the crosswalk is still delayed almost one year on. Now, thanks to reporting in the ‘Princeton Packet’, we have learned that Mercer County, which operates Washington Road as CR 571, has not yet even approved a plan for a crosswalk. The proposal is stuck, as Princeton’s Historic Preservation Commission ponders what design meets their requirements for ‘aesthetic concerns’. Meanwhile, an unsafe condition persists, and trail users are being put at risk every day. In particular, the Historic Preservation Commission seems fixated on finding a ‘less-intrusive’ design for beacons that would indicate to car and truck drivers that a trail crossing is present. From a traffic safety perspective, however, the entire point is to find an instrusive design. If the design blends in so that drivers don’t see it, then it is failing in its job of indicating the presence of the trail. Given that there is already a massive, busy road running through the site, it seems bizarre to worry about an intrusive crosswalk design. 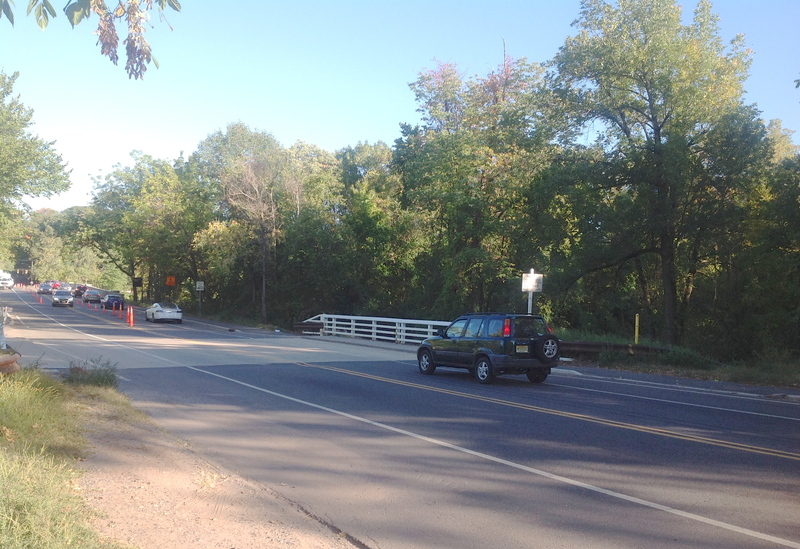 The quibbling again suggests that the needs of walkers and cyclists are a low priority in Princeton, and the slow pace of approval calls into question whether the Historic Preservation Commission should have oversight of road design. Mercer County should never have allowed a road design with no crosswalk for the D&R Canal Trail at Washington Road. Nearby trail crossings of Alexander Road and South Harrison Street both have upgraded crosswalks, and of the three roads, Washington Road is the one with the highest posted speed limit. Mercer County has endorsed a ‘Complete Streets’ policy, but this intersection is clearly dangerous by design. The County Freeholders are now compounding the previous failure to conduct an appropriate risk assessment by failing to expedite construction of a new crosswalk. Instead of finger-pointing, we need a safe trail crossing now, and a renewed commitment to the safety of people walking and on bikes. This entry was posted in Biking, Complete Streets, Princeton, Trails, Transit and tagged Complete streets, crosswalks, mercer county, Princeton, road safety. Bookmark the permalink. No no no! It’s the Department of Environmental Protection’s historic preservation office and the Delaware and Raritan Canal Commission that are just as guilty for slowing this down. The Canal Commission has also thwarted much needed crosswalks at numerous other canal towpath crossings including ones at very busy Amwell Road in Franklin Township and on 518 near Rocky Hill. I’m all for historic preservation but public safety CANNOT take a back seat! Elizabeth H. Kim, the town’s historic preservation officer, last week issued preservation commission members a memo in which she touched on the beacons issue. Is Ms. Kim a traffic safety professional?!?! I think she should stick to historic preservation. Rectangular Flashing Beacons and HAWK beacons have a proven track record of safety. She should know better then to make anecdotal claims where public safety is at stake. Actually, it is unfortunately well-documented that irresponsible motorists speed through flashing beacons, so Ms. Kim has a point. A more appropriate fix is a *road narrowing*, where the road narrows with high curbs. This slows motorists down every time. Jersey-barrier-height curbs needs to appear between the shoulder and the road, giving a closed-in, “don’t you dare speed” appearance to the cars, and *then* the marked crosswalk. The problem is that this road appears too open and wide, with huge shoulders. The road is designed to encourage speeding. If you want a safe crosswalk, you have to end that.